I took this picture of Camille, my pet Chameleon at home. Camille was very tame and she would take grasshoppers from our fingers without hesitation. For this picture, I set my camera on a tripod, Camille on a branch very close and I put the grasshopper on top of my lens. 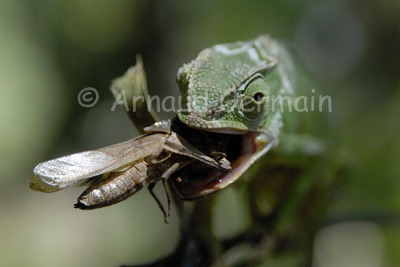 Camille struck, took the grasshopper and started munching. As I used my 105mm macro lens with a large aperture, the depth of field is very narrow, reinforcing the focus on Camille's mouth and her meal.